Do you like clean energy, air, and water? An Initiative To Amend The County General Plan And County Code To Prohibit Petroleum Extraction And Well Stimulation Treatments, Including Hydraulic Fracturing And Acid Well Stimulation, On All Lands Within The Unincorporated Area Of The County. 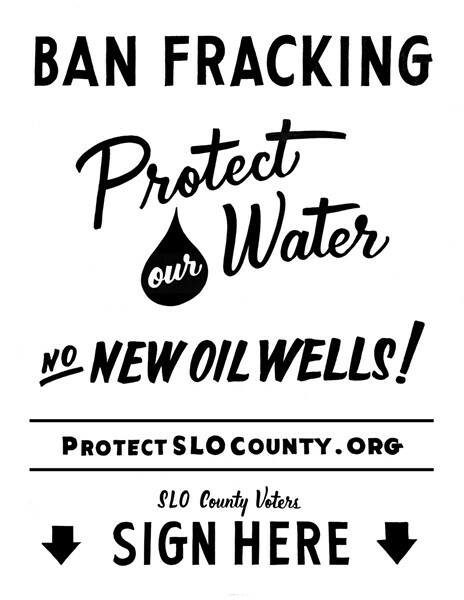 That's the ballot measure that will ban fracking and halt oil industry expansion plans in SLO County. Petitions are now circulating to ensure that oil well fracking does not happen here. A quick refresher: "Fracking" refers to the process of extracting natural gas and/or oil from rock formations using fluids, gases, and chemicals at high pressure, hydraulically fracturing the rock. Fracking operations have negative impacts on air and water quality and frequently necessitate drawdowns on surface water and groundwater. Fracking and its waste disposal can cause seismic events. It has devastated thousands of neighborhoods and thousands of square miles of land across the country. The measure also allows that "petroleum extraction land uses lawfully existing on the effective dates of the applicable amendments may continue ... but such uses may not be enlarged, increased, or extended," effectively canceling the oil industry's current plans for a vast expansion of operations in our county. That's huge—so huge, it can actually have an effect on global, not just local, greenhouse gas emissions because California crude oil is at least 15 percent more carbon intensive than average crude oil blends elsewhere. This fact recently moved the Stockholm Environmental Institute to issue a briefing paper titled "How limiting oil production could help California meet its climate goals." All climate-aware persons know the importance of "keeping it in the ground." Keeping this oil in the ground is at least 15 percent more important than keeping it in the ground almost anywhere else in the world. Guess who's going to object to this? And can we possibly win against Big Oil? Yes we can. In November 2016, a similar initiative was on the ballot in Monterey County. In opposition, Big Oil outspent the grassroots campaign backing the initiative by 18 to 1. The initiative won with 56 percent of the vote. Two years earlier, a San Benito County initiative sailed to victory. Likewise, in Mendocino County. Great, you say! I'll just sit back and wait for Election Day or the arrival of my ballot in my mail box, and fill in that circle or punch that card. Done deal, right? Nope. The initiative has to get on the ballot first. Unless we get a measure on the ballot that "just says no," prepare for yet another fight down the road to halt yet another huge proposed oil project (Phillips 66 oil train terminal, 2013-2017; Huasna Valley oil drilling project, 2008-2012) that would take the nature and character of SLO County a giant step away from an economy based on tourism and agriculture and a giant step toward becoming an oil producing region as the San Joaquin Valley oil fields are depleted. And the ultimate fate of the project—and the one after that, and the one after that—would rest in the hands of whoever, on any given Tuesday, happens to be sitting on the dais at the SLO County Board of Supervisors for all the years to come. Fun fact: In 2016, California's Division of Oil, Gas, and Geothermal Resources reported receiving more oil well permit applications than it has in decades. This is not a drill. Andrew Christie is director of the Santa Lucia Chapter of the Sierra Club. Send comments through the editor at clanham@newtimesslo.com or get your thoughts published by emailing a letter to letters@newtimesslo.com.